Do you wake up in the morning with pain or tension in your hips? Is your mattress too firm or starting to wear out? If so, you might want to add a mattress topper to your bed. Our number one mattress topper for hip pain is the UTTU 3-Inch Red Respira Memory Foam Mattress Topper, which uses two layers for breathable pressure relief. Our second favorite option is the ViscoSoft 3 Inch 3.5 lbs. Density Gel Memory Foam Mattress Topper, which has a dense, supportive feel. Getting a new mattress is the most promising change you can make when it comes to relieving your body pain. But, getting a mattress topper can hold you over until you can afford to buy a new bed. Alternatively, you might be satisfied with your current mattress but need a little extra pressure relief. Or, perhaps your bed is a bit on the firm side for your taste and you want to make it a little softer. Whatever your situation, a mattress topper might be able to help. We’ll cover our favorite picks, then go over some important information to keep in mind before you make your purchase. We know that finding quality information on the internet can be a challenge these days. We’ve decided to gather the top 6 mattress toppers for hip pain available on the market right now to make your research process a little easier. The UTTU 3-Inch Red Respira Memory Foam Mattress Topper is a luxurious product with a dual-layer comprised of two types of foam. 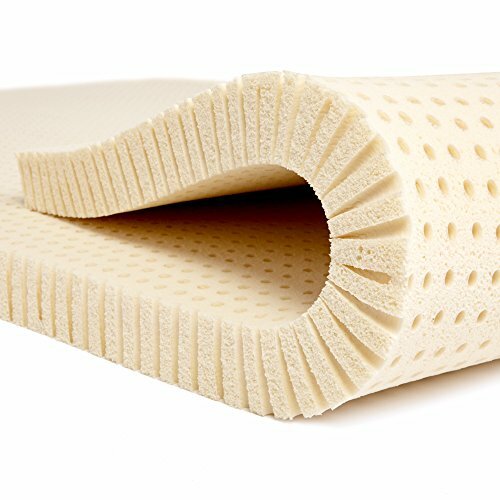 These foam layers work together to relieve pressure, keep you cool, and provide comfort and spinal alignment. As you lie on this mattress topper, your body weight will be evenly distributed, encouraging your muscles to relax and potentially easing pain. The UTTU 3-Inch Mattress Topper has a soft cover made with a polyester/rayon blend that can be removed and machine washed. The topper uses a ventilated design to promote airflow and prevent you from overheating. It also isolates motion, so you and your partner don’t disturb each other if one of you is having a restless night. If you aren’t satisfied with this topper, you can get a refund and it also comes with a 10-year warranty. 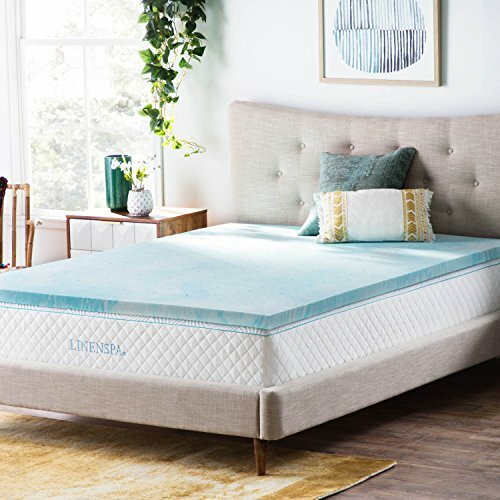 The Linenspa 2 Inch Gel Swirl Memory Foam Topper is made with open-cell foam, a breathable material that conforms to your body and regulates your sleep temperature. Users report that this mattress topper helps with pressure points, which is good news for hip pain sufferers. The Linenspa 2 Inch Gel Swirl Memory Foam Topper can be added to a firm mattress to make it feel a bit softer. This mattress topper is gel-infused to help disperse heat and prevent you from getting too warm. Note that since it’s made from memory foam, there may be a slight off-gassing odor present. Leave the topper in a well-ventilated room to get rid of this smell. The Linenspa 2 Inch Gel Swirl Memory Foam Topper comes with a 3-year warranty to protect your purchase. 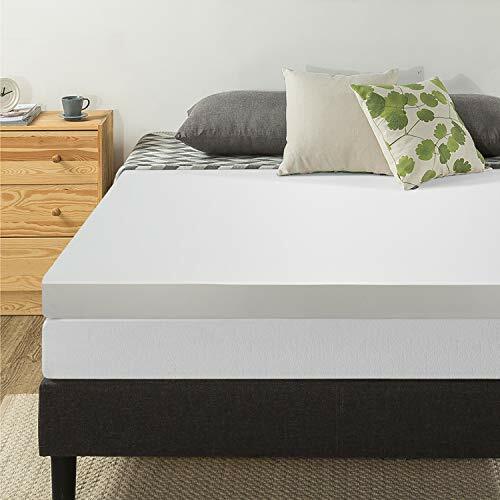 The Best Price Mattress 4-Inch Memory Foam Mattress Topper is suitable for couples because its thick design makes it great at isolating motion. If you or your partner is a light sleeper, this can help you rest peacefully through the night by minimizing motion transfer through the surface of the bed. The memory foam in the Best Price 4-Inch Mattress Topper conforms closely to your body, encouraging pressure relief. The product comes with a breathable polyester mesh cover and can be spot cleaned and air dried as needed. Note that 4-inch toppers are relatively thick and should only be used by people who like the feeling of sinking into their bed. The Best Price 4-Inch Memory Foam Mattress Topper comes with a 5-year warranty. The ViscoSoft 3 Inch 3.5 lbs. Density Gel Memory Foam Mattress Topper is a dense topper that doesn’t allow you to sink very far into it. It could be a good choice for people who know they like the feel of memory foam but don’t want to sink in too much. The bamboo-derived rayon cover on this topper is soft, hypoallergenic, and promotes a cool sleep experience. Note that the straps that hold this topper in place might not fit perfectly with some mattresses, causing the topper to shift in the night. The ViscoSoft 3 Inch 3.5 lbs. Density Gel Memory Foam Mattress Topper comes with a 60-day money back guarantee and 3-year warranty to protect your purchase. 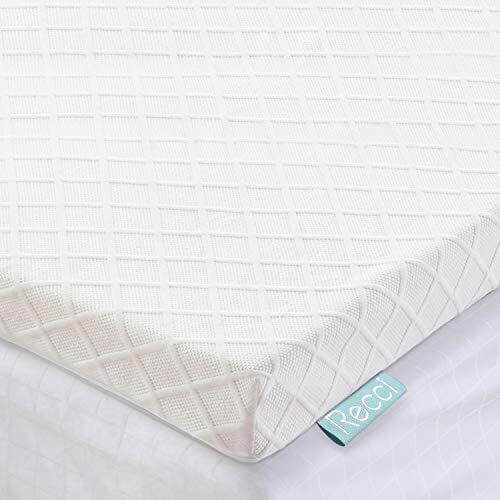 The Recci 3in Memory Foam Mattress Topper has a hypoallergenic cover made from bamboo-derived viscose rayon. It’s resistant to bacteria, dust mites, and other potential allergens. This material absorbs moisture, has a soft feel, and offers temperature control. The cover is removable and can be machine washed, but follow care instructions closely. 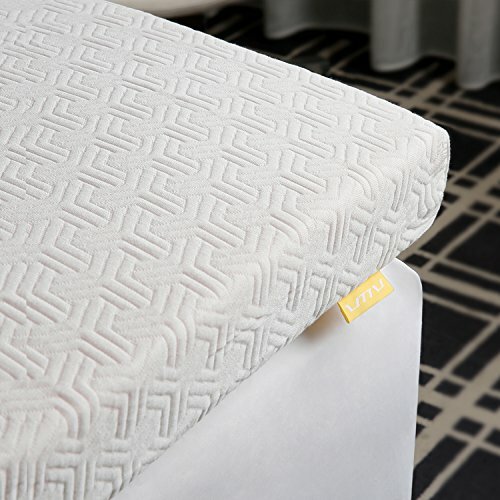 The foam in the Recci 3in Memory Foam Mattress Topper conforms closely to your body to alleviate pressure points. You can try out this mattress topper for 30 days, risk-free, and return it for a full refund if you aren’t satisfied. In addition, the Recci topper comes with a 10-year warranty to cover quality-related problems. The Pure Green 100% Natural Latex Mattress Topper could be a good choice for people who don’t want to sink into their topper. It’s made with durable natural latex foam, a responsive, heat neutral material that will help you sleep at a comfortable temperature. While this material is comfortable and supportive, it doesn’t create the same cradling sensation as memory foam. Instead, it has a slightly springy feel that makes it easy to switch positions in the night. Contact the seller directly to get warranty information for this product. Should you choose a firm or soft mattress topper to help with your hip pain? While a firm feel can support a neutral spine, softness can provide contouring pressure relief. Both of these factors can help with hip pain, so the firmness level you choose should come down to your personal preference and the cause of your hip pain. The topper you pick should also depend on how firm your mattress is. People with a very firm mattress may want to soften up the feel of their bed by adding a topper. People who already have a soft mattress may not need a topper at all since it would be adding a plush material to an already plush surface. This could cause your bed to be too soft, which may make your pelvis sit too low and end up worsening your hip pain. As a general rule, most sleepers should do well with a mattress topper between two and three inches thick. If you want a lot of sinkage, you can opt for a 3.5 or 4-inch topper, instead. Toppers that are less than two inches thick probably won’t provide much in the way of comfort or pressure relief, so keep that in mind. The temperature at which you sleep has a large impact on your sleep quality. In order to sleep cool and stay comfortable, you should choose a mattress topper with cooling technology, like gel infusion, open-cell foam, or breathable fabric. Many top-quality mattress toppers are made from memory foam. While this material is great for conforming to your body and relieving pressure, it does often come with an off-gassing odor. This strong chemical smell will fade with time, but extra sensitive sleepers will want to leave their topper in a well-ventilated room to help the smell dissipate quicker. Memory foam: Memory foam is a good choice for hip and back pain since it contours to your body, offering a customized level of comfort. As the foam conforms to your unique shape, it helps evenly distribute your body weight so you can relax fully while you sleep. You should only choose memory foam if you already know that you enjoy the sinking sensation it brings. This is a very specific sensation that not everyone likes. Note that since memory foam absorbs heat more than other materials, you should look for added cooling technology in this type of topper. Latex: Latex is another good material for hip pain sufferers since it also offers pressure relief. It has a springy feel that makes it easy to move around in the night and it’s a breathable material that doesn’t retain heat as much as memory foam. One potential downside of latex is that it tends to be quite expensive. When possible, try to opt for natural latex (which is higher quality) instead of synthetic latex. 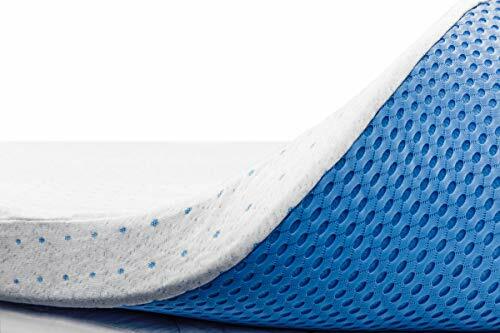 Pillow top: Pillow top mattress toppers could be a good choice for people who are suffering from hip pain due to pressure points from a mattress that’s too firm. Pillow top mattress toppers aren’t the most supportive but they do offer a layer of plush comfort to your bed. Q: Could my sleep position be affecting my hip pain? A: People who sleep on their side might experience more hip pain than those who favor other sleep positions. In the side sleeping position, all of your body weight is resting on your hips and shoulders, which can lead to pressure points over time. If you’re suffering from hip pain and usually sleep on your side, try switching to the back sleep position which may distribute your weight more evenly. For more detailed questions about sleep position and hip pain, ask your doctor for advice. Q: Do I need to buy a new mattress to solve my hip pain? A: While a mattress topper might help add some comfort to your bed, there’s no replacement for buying a new mattress. A new mattress can potentially relieve pressure and promote a neutral resting position for your body. Too soft of a bed can cause your hips to sink too far into the bed, leading to aches and pains. Too firm of a mattress, on the other hand, could leave you feeling stiff. Q: Will a mattress topper revive my old, worn out mattress? A: Again, there’s no replacement for buying a new, high-quality mattress. But if you can’t afford to spend the cash at the moment and just want some extra comfort in the meantime, a mattress topper could help bring some life to your old bed. Q: Are all mattress toppers comfortable? A: Not all mattress toppers are built for comfort and some are designed just to cover the top of your bed. Non-padded mattress toppers are typically used to provide a protective barrier against spills and stains for your bed. When you’re choosing a mattress topper for hip pain, though, make sure you pick a padded option that will provide comfort and pressure relief. As you can see, adding a mattress topper to your mattress could potentially ease your hip pain. Keep in mind that you might require more than just a mattress topper to help your pain, depending on its cause, and you should ask your doctor if there’s anything else you can do. Our favorite mattress topper for hip pain is the UTTU 3-Inch Red Respira Memory Foam Mattress Topper. This option uses breathable foam and has a soft, machine washable cover.